(Approx. 30 min.) Includes: Cleansing, toning, mask, facial massage and moisturize. Removes the of skin impurities- the gentle massage movements are designed to increase lymph and blood flow, which can help the pores get rid of toxins naturally. Increased collagen production – regular facial massage can make the skin more flexible and toned, and stimulating key pressure points may also help increase collagen production. This facial includes double cleansing, exfoliating with Circadia's cocoa enzyme, extractions and then a mask, followed by High Frequency to calm any irritation or inflammation. This treatment gently exfoliates the skin with a medical grade blade to remove dead, dull skin cells and unwanted peach fuzz, leaving your skin smooth and glowing. Dermaplaning is a great option to prep your skin for an event or as part of your normal monthly routine. Dermaplaning service will be combined with a customized facial that suites YOUR skincare needs. No downtime. This skincare treatment is used to exfoliated and suction away the dead skin cells with the added benefit of stimulating cell turnover, the production of collagen and increasing blood flow to the skin. Even though microdermabrasion will give you some results within your first visit. However, for best results you will need to have at least 4 or 5 sessions. concerns such as; textured skin, acne, hyperpigmentation, fine lines, wrinkles and many other types of skin concerns. Includes: Cleansing, extraction, exfoliation, cell turn over, renewal, SPF, & hydration. This special anti-aging facial treats the face, neck, and decolletage with Circadia's Raspberry enzyme along with Supersonic exfoliation to stimulate blood circulation, produce new collagen, and slow signs of aging. Skin Type: All levels of aging skin-wrinkle, Rough Complexion/Uneven Skin Tone This resurfacing agent treatment is very mild, yet prickly feeling. This Alpha Hydroxy Acid penetrates very quickly to lower levels of the skin. During the treatment the skin will feel tight and fresh. Within 24-48 hours the skin may experience some light shedding of old, dead skin cell. This is how the regeneration of new cells and increased production of collagen happens to create younger, healthy, and less wrinkled skin. Skin Type: Superficial Pigmentation, Sun/Brown spot, Uneven skin tone. This peel was designed specifically for attenuating pigmentation issues. This peel can be classified as a modified Jessener containing 7% Lactic, 7% salicylic, and 7% resorcinol, in an ethanol base quillaja bark. This pigmentation resurfacing cockail treatment is a wonderful blend of agents designed to tighten and brighten. May be repeated every 3-4 weeks. This treatment specifically targets clogged pores, sensitivity, and razor burn while promoting total relaxation. This facial includes deep cleansing, steaming, and extraction. As a final step; a treatment mask is applied to refine the pores, soothe and hydrate the skin. Cleansing & relaxing back facial with exfoliation, massage, and extraction to keep your back clean and clear. For our Brazilian Wax clients, please keep in mind the hair should be around 1/4 of an inch long. If trimming is needed it will be an added charge of $10. “Steamy Wonder” steam canopy can give you all the benefits that steam has to offer without the claustrophobic feeling of a steam room. 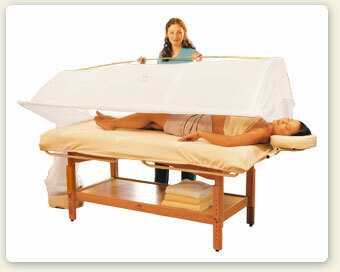 This treatment is very relaxing and beneficial. Many of the benefits of this service are detoxifying, loosen muscle tension and weight loss. For maximum results try this service before or after a massage. Try this Steamy Wonder treatment and you'll never go back to sitting in a hot box or sauna. It is simply more relaxing and healthier to lie down and keep the head cool while steaming. The Steamy Wonder eliminates the discomfort of breathing hot air and avoids the dizziness that can result from heating the head. You can also move around, change position (raise your knees, turn on your stomach or back) while still enjoy complete comfort and privacy. Eliminate the Wraps with Steamy Wonder- The Steamy Wonder can be used to enhance or replace body wraps. The warm, moist heat opens the pores allowing effective product penetration; sweating produces the 'shrinkage' effect that makes wrapping so popular. In other words, your jeans should be looser after a steam treatment! Mud and seaweed wraps can be given without any wrapping, increasing the comfort of the client, decreasing work for you.